The "lavender ceiling" has been shattered — after nearly a century in place. On Sunday at around midnight, "Moonlight" became the first LGBTQ film ever to take the Best Picture prize at the 89th annual Academy Awards. Many LGBTQ-centered films have been nominated for Best Picture in the past. Critically-acclaimed movies like "Milk," "Brokeback Mountain," "Boys Don't Cry," and "Philadelphia" all told stories of LGBTQ characters — some real, some fictional — who fought against or suffered from discrimination. None of the LGBTQ nominees ever snagged the Best Picture award, though three of the four mentioned above resulted in acting awards for straight actors who took on gay or transgender roles. "It has often been noted that playing queer characters, especially queer characters who die, is one of the best ways to get a Best Actor statue," LGBTQ film historian Jenni Olson noted in an email to NBC Out. Olson said "Milk" and "Brokeback Mountain" were "the big heartbreakers" when they failed to win the top prize, despite many believing they might be poised to finally break through. In 2016, queer hearts broke again as "Carol" was snubbed at the Oscars — not even receiving a nomination for Best Picture. Olson said she was "saddened" to see Cate Blanchett lose the Best Actress award, noting that it was rare to see a leading Hollywood actress portray a lesbian character who doesn't die at the end of the film. Not only does "Moonlight" end on an uplifting note, the film breaks barriers by presenting the largely autobiographical story of a living, black, gay man told in his own words. Tarell Alvin McCraney, whose script "In Moonlight Black Boys Look Blue" was the basis for the film, also took an Academy Award for Best Adapted Screenplay on Sunday. In October, McCraney told NBC Out "Moonlight" isn't just a "gay film" or a "black film," that it would be "disingenuous" to limit the story to just one category. "Whether or not it does it a disservice, it's more about what the truth of it is," McCraney said. "It is a queer story, it is a gay story, it is a poverty story — you know what I mean? It is a story about drug addiction." Director Nneka Onuorah, whose 2015 documentary "The Same Difference" won awards and accolades for its examination of black lesbian gender roles, told NBC Out that "Moonlight's" win cements the idea that a story told from a marginalized perspective can be universally relatable for all audiences. "For so long people thought because the story is black or gay then that means it's not mainstream," Onuorah said. "We are humans. We all can relate to the idea of toxic masculinity. We can relate to repressing our feelings. So why is it that Hollywood tries to say that these things won't reach bigger audiences?" Even NBC Out contributor Rob Smith surmised last week that "Moonlight" was unlikely to grab the pinnacle prize, given the Academy's reputation as far from inclusive. Sunday night's diverse crop of winners — along with the Academy's recent invitation to hundreds of women and people of color to join its homogenous ranks last year — could potentially help it overcome that reputation. 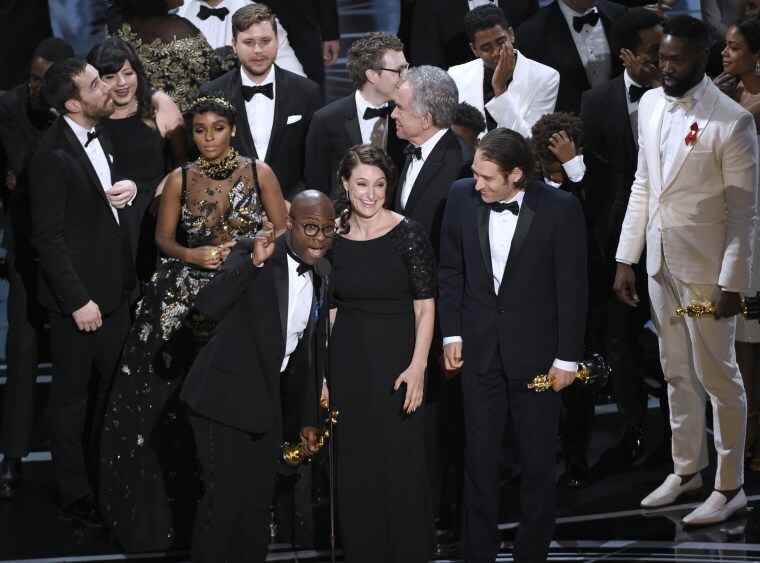 Moonlight's big win comes one year after Broadway Black editor April Reign launched the #OscarsSoWhite hashtag, used thousands of times to criticize the Academy of Motion Picture Arts and Sciences for nominating only white actors for awards in 2016. This year, a record-breaking five black filmmakers, writers and actors won Oscars. In addition to "Moonlight's" Best Picture and Best Adapted Screenplay (shared by Jenkins and McCraney) wins, awards also went to Viola Davis for Best Supporting Actress, Mahershala Ali for Best Supporting Actor (for "Moonlight") and Ezra Edelman for Best Documentary Feature. According to the Los Angeles Times, only three awards have ever simultaneously gone to black people at a single Academy Awards ceremony before — once in 2010 and again in 2014. For Bahamian-born filmmaker Sekiya Dorsett, it's important to identify "Moonlight" as the barrier-bursting black, gay film that it is, because that means the stories of queer people of color have a reach like never before. "Barry Jenkins has crafted a story where we black and brown queer individuals were seen. Our lives were seen. Our love was seen. Our hurt was seen," Dorsett told NBC Out. "Now it's gotten film's highest honor." Dorsett cheered the way that winning Best Picture places a film in an unrivaled canon, one that doesn't historically include many stories told by marginalized voices. "Professors will have no choice but to add ["Moonlight"] to their curriculum," Dorsett said. "It's written in history." For writer and advocate Tiq Milan, a film like "Moonlight" can't be separated from the cultural context in which it is being watched. "The last few years have been particularly trying for black folks," Milan told NBC Out, "With the police brutality and the constant parade of brutalized black bodies on the news to the epidemic of black trans women being murdered in this country, we were looking for some gentleness. Some stillness. 'Moonlight' gave us that." Milan also noted that a victory was sorely needed in the current political climate, after a month of fierce opposition to the new federal administration and concerns that domestic policy could be backsliding when it comes to progress and equality. "'Moonlight' was the win we all needed right now," Milan said. "It sends a clear message that our stories are nuanced and beautiful and valuable."